Here we have a quick share of the items in my 3 shops that celebrate the greatest Holiday during the greatest season. 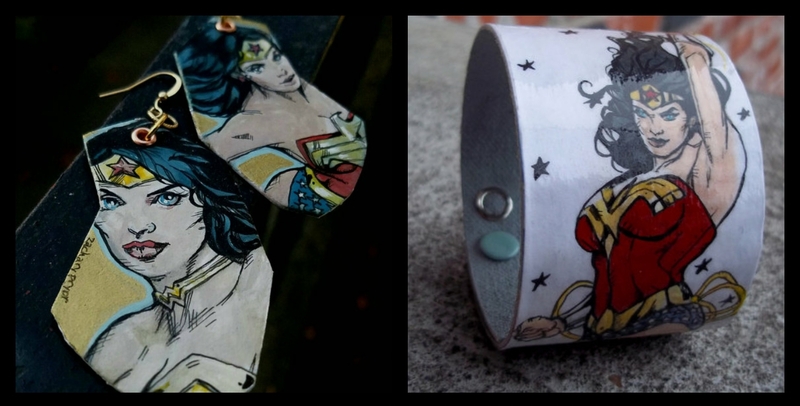 I just know we will see thousands of Wonder Women out there this year. 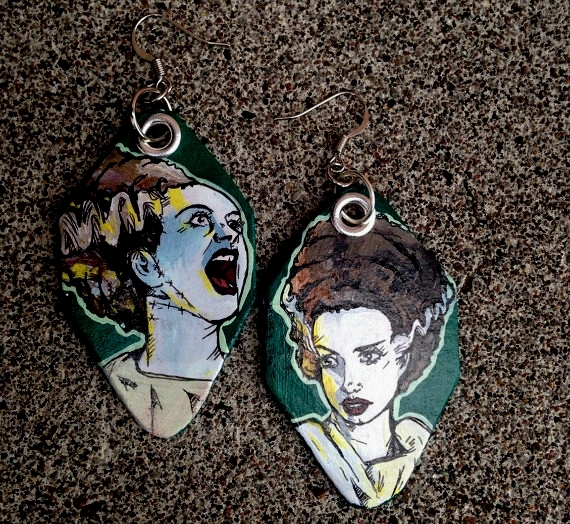 I have been painting her for years and these two are my favorite, earrings with gold leaf and a painted cuff. 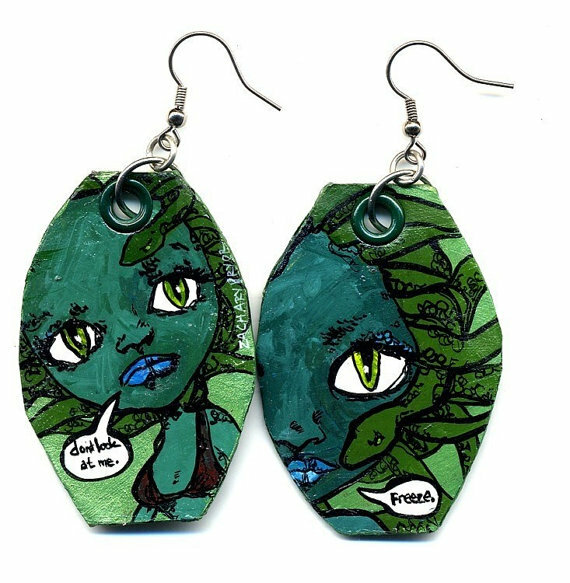 One of my first creations, the Blythe doll inspired Medusa, perfect if the ancient Gorgon is on your mind for this holiday. PURCHASE HERE. No Halloween post would be complete without giving a nod to Buffy Summers. I loved Buffy the Vampire Slayer the minute the show first aired and my obsession grew and grew. At the time it was airing it was the only show I watched. 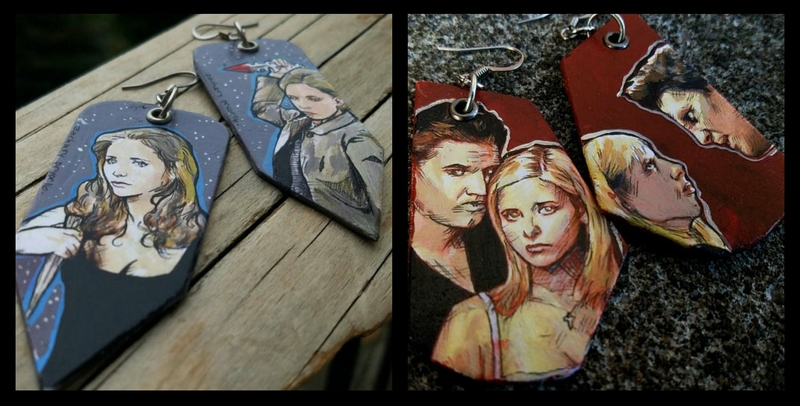 You can get the Buffy Mr. POINTY pair here and the Buffy and Angel pair here. Feeling spooky animals instead? 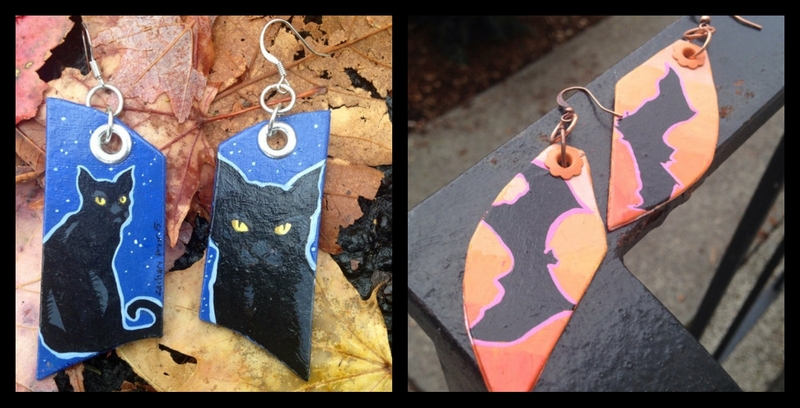 How about a royal blue black cat silhouette or an orange ombré bat silhouette? Not everyone knows of this gorgeous, dangerous vixen, but they should. 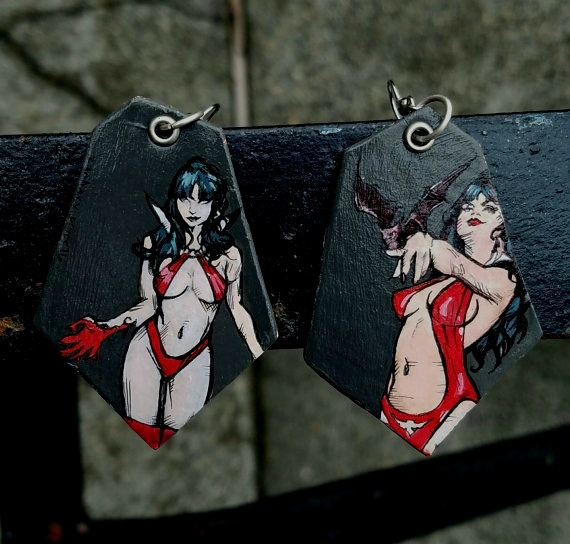 This is Vampirella, the comic book anti-hero. Get her HERE. 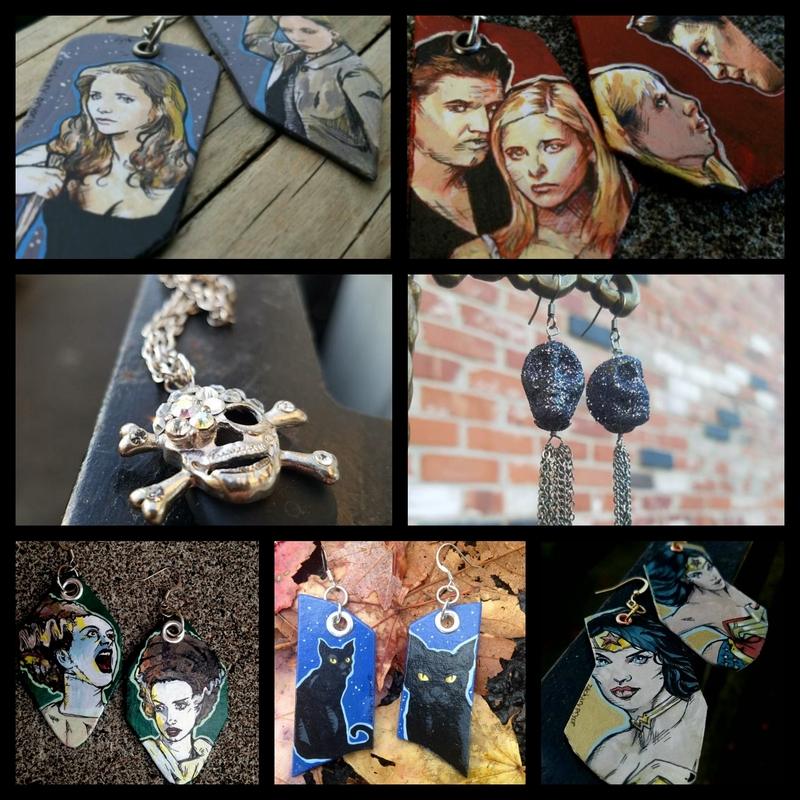 Finally my etsy shop featuring gemstone, chain, and charm creations both new and upcycled has two gorgeous skull pieces in stock that would look great during this season, even while you aren’t in costume. 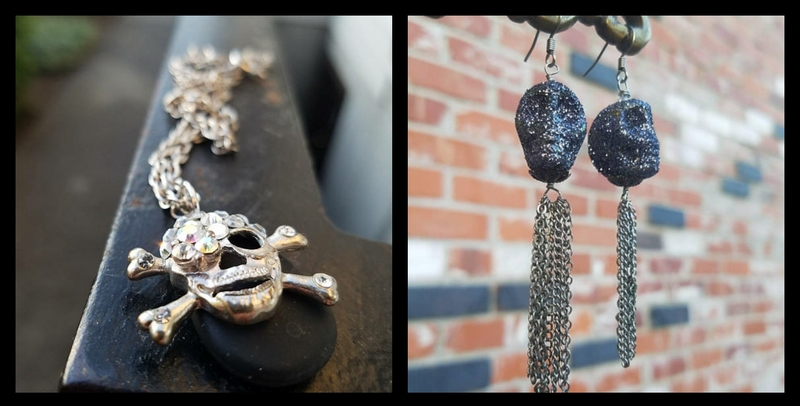 Click to get the Glitter Skull Tassel earrings or the Rhinestone matte black stone necklace. Have a wonderful Halloween everyone!!! This entry was posted on October 16, 2017 by Zachary Pryor. It was filed under Uncategorized and was tagged with all hallows eve, bats, black cat, bride of frankenstein, buffy and angel, buffy summers, buffy the vampire slayer, cosplay, day of the dead, Etsy, halloween, halloween art, halloween cosplay, halloween earrings, halloween jewelry, medusa, medusa costume, skull, Vampirella, wonder woman, wonder woman cosplay, wonder woman costume, zachary pryor.